In the United States, bone grafting was used for treating nearly two million patients between 1992 and 2007.1 Even complex bone trauma, which may include a non-union of a long bone fracture, a multiple fracture, surgical implantation of devices, like screws, plates, or joint replacements, or bone loss caused by disease, were healed with the help of bone grafts. In bone grafting, bone is used from another part of the patient's body, for example hips, ribs or pelvis, (an autograft) or bone harvested from a deceased donor or cadaver that has been fully cleaned and preserved in a tissue bank (an allograft). However, bone grafting can still be improved further, despite the fact that it is considerably enhancing bone regeneration as well as clinical outcomes following severe loss or injury of bone. Scientists are exploring different ways to improve bone grafting methods and provide denser and faster regeneration of bone with reduced morbidity. Autologous bone grafting, commonly known as autograft, was believed to be the preferred means of bone grafting modality,2 but artificial bone grafts are favored over autografts because they are not only readily available but also prevent the need for additional surgery. Despite this fact, bone graft substitutes can have certain limitations with regards to its strength under torsion. Bioactive glass, in terms of its strength, biocompatibility, and a host of achievable properties, has been widely used to facilitate bone repair and provide support in tissue engineering.3 This article explores how bioactive glass is used in bone grafting. Bone grafting is useful for substituting bone that is missing due to disease/trauma or for repairing bones that have been considerably affected by trauma. Using this surgical procedure, bone can also be strengthened at the site of an implant, whether it is a screw, dental implant or joint replacement. The bone graft also serves as a framework to support and promote the growth of fresh, living bone. Since autografts do not have the risk of rejection, they have been traditionally regarded as the preferred method of bone grafting modality. However, autografts require additional surgery, which raises the risk of infection as well as patient morbidity. In addition, there might be problems with availability and looking for an appropriate site to harvest bone of the required size and shape. While allografts prevent the need for additional incisions, they carry an associated risk of immune response that rejects the graft. Availability issues are another challenge because the donated bone has to be tissue matched with the specific patient. Using a man-made substitute and not depending on bone for the graft is the third option. Many different materials, such as hydroxyapatite, collagen, calcium phosphates, to name a few, are readily available and have been studied in detail for use in bone grafting. When bone substitutes are used, it is important to carefully consider the nature of the materials in terms of strength, resorption rate and biocompatibility. With bone graft substitutes, the above processes are facilitated and improved to allow rapid development of new, strong bones. For orthopedic trauma, bone graft substitutes are often employed to fill bone defects. A synthetic bone graft substitute would ideally have efficacy that is somehow similar to autograft – no immunogenicity, osteoconductive and osteoinductive properties, safety concerns, and predictable resorption and degradation time. In addition, different characteristics exist in different bone substitute products, which can only offer minimal structural integrity and also none of these can target all the three key processes of bone formation.9 There are some bone substitutes that can closely imitate the natural bone structure, but they do not have osteoinductive and osteogenic properties. In many tissue engineering procedures, bioactive glass has been used successfully.3 In fact, its intrinsic strength, biocompatibility and versatility, which was attained through customization of properties via composition adjustments, have made it a key candidate for enhancing synthetic bone substitutes. When bioactive glass is introduced into the body, specific biological activity is induced that promotes the release of soluble ionic species. This causes the glass to be coated with a hydroxyapatite-like substance. After this layer is formed, bioactive glass bonds strongly with both soft and hard tissues. This bioactive glass can also be developed to release the nutrients needed for bone regeneration. Bone grafting serves as a valuable tool for the repair and treatment of diseased or damaged bone. Autografting is the gold standard, which prevents rejection reactions by using the bone harvested from the patient. However, studies are ongoing to find a suitable alternative, because the additional surgery required to harvest bone for grafting procedure can increase patient morbidity. While substitutes have been shown to be effective, they fail to promote the formation of new, strong bone. Bioactive glass is biocompatible and improves the formation of new and strong bones. It has been shown that when bioactive glass is added to bone substitutes, it can boost their efficacy as well as bone healing properties to rival those acquired with autografting. Flierl MA, Outcomes and complication rates of different bone grafting modalities in long bone fracture nonunions: a retrospective cohort study in 182 patients. J Orthop Surg Res. 2013;8:33. Bajammal SS, et al. The use of calcium phosphate bone cement in fracture treatment: a meta-analysis of randomized trials. J Bone Joint Surg [Am] 2008;90-A:1186-1196. Swiontkowski MF, et al. Recombinant human bone morphogenetic protein-2 in open tibial fractures: a subgroup analysis of data combined from two prospective randomized studies. J Bone Joint Surg [Am] 2006;88-A:1258 1265. Lerner T, et al. A level-1 pilot study to evaluate of ultraporous beta-tricalcium phosphate as a graft extender in the posterior correction of adolescent idiopathic scoliosis. Eur Spine J 2009;18:170-9. Dimar JR, et al. Clinical and radiographic analysis of an optimized rhBMP-2 formulation as an autograft replacement in posterolateral lumbar spine arthrodesis. J Bone Joint Surg [Am] 2009;91-A:137 186. Carragee EJ, et al. 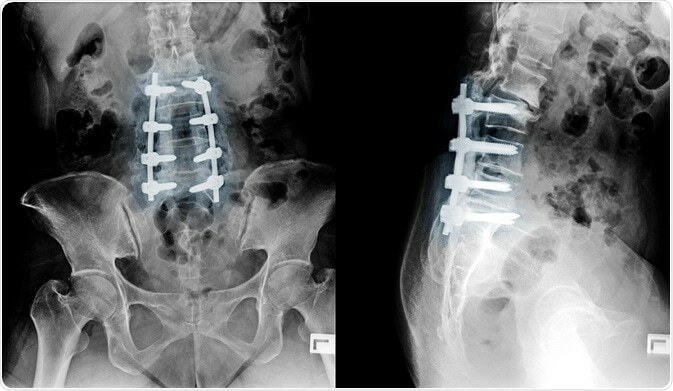 A critical review of recombinant human bone morphogenetic protein-2 trials in spinal surgery: emerging safety concerns and lessons learned. Spine J 2011;11:471 191.